Fresh fish is an extremely perishable food as compared to other food commodities (Gram and Huss, 1996, Chouliara et al., 2004). Therefore, fish muscle undergoes a series of changes during storage under modified atmospheres and conventional chilled storage, resulting in its deterioration and loss of quality (Ruiz-Capillas and Moral 2004). Although the main changes take place bacterial growth, the first changes in fish tissues occur from autolytic reactions controlled by native enzymes, such as in the adenosine triphosphate (ATP) breakdown process (Kennish and Kramer 1986). The pathway of ATP catabolism in fish muscle has been extensively documented as a degradative sequence to adenosine diphosphate (ADP), adenosine monophosphate (AMP), inosine monophosphate (IMP), inosine (Ino) and hypoxanthine (Hx). Immediately after the death of a fish, ATP begins to degrade to IMP which further degrades to uric acid by an endogenous enzymatic autolysis (Veciana-Nogues et al., 1996). ATP and ADP generally disappear around 24 h after death. AMP also decreases rapidly and its concentration becomes negligible. On the other hand, IMP increases sharply around 5- 24 h after death and decreases gradually. Inosine (Ino) and Hx start to increase when IMP begins to decrease (Saito et al., 1959, Park and Kim 1999). IMP is known to contribute to the pleasant flavour of fresh fish whereas Hx is involved in the progressive loss of desirable fresh fish flavour (Huynh et al., 1992, Özoğul and Özogul 2002). The accumulation of Ino and Hx in fish species appears to be related to both autolytic and microbial action, although the former seems more important. On account of this, nucleotide degradation products have been widely used as indicators of storage age or freshness (Mende et al., 2001). It is well documented in the literature that rates and patterns of changes in the level of adenine nucleotides and their related compounds during storage differ according to fish species (Dingle and Hines 1971), within species of fish (Murata and Sakaguchi 1986, Ryder et al., 1984), storage conditions (Uchiyama et al., 1970), and muscle types (Murata and Sakaguchi 1986, Vazquez- Ortiz et al., 1997). Modified atmosphere packaging (MAP) and vacuum-packaging (VP), along with refrigeration, have become increasingly popular preservation techniques, which have brought major changes in storage, distribution, and marketing of raw and processed products to meet consumer demands (Özogul et al., 2004). Modified atmosphere packaging (MAP) has been used successfully to extend the raw fillet shelf-life of many fish species (Cann et al., 1984, Scott et al., 1984, Barnett et al., 1987, Fagan and Gormley 2004). MAP has been shown to decrease the rate of degradation of ATP in fish (Özogul et al., 2000a). The aim of present research, thus, was to investigate ATP and its breakdown products in sardine stored in vacuum package, modified atmosphere package and at 4°C. Sardine (Sardina pilchardus) (average weight: 13 ±5g), obtained from Mallaig in Scotland, were gutted and divided into three lots. The fish stored in ice were 2 days post capture on arrival at the laboratory. One lot was stored in boxes without ice at 4oC and the remaining two lots were placed in nylonpolyethylene pouches (30 x 35 cm); the second lot vacuum packed and the third lot gas packed in a Multivac model A 300 vacuum-packaging machine (Bury, Lancs., UK). The O2 transmission rate of pouches was 47 cc/m2 24h. The gas ratio was 60% CO2 and 40% N2 typical for packing fatty fish in MAP. The final gas/samples ratio in all pouches was about 2:1 (v/w) for MAP conditions. For each treatment, triplicate samples were used for nucleotide analysis for each lot kept under three storage conditions. ATP and its breakdown products were analyzed according to method of Özogul et al., 2000b. Five grams of muscle from the dorsal region of the sardine were chopped and extracted with 25 ml of 0.6 M perchloric acid for 1 min in ice bath. The extraction mixture was centrifuged at 3000 g for 10 min, and 10 ml of supernatant taken and quickly neutralized to pH 6.5–6.8 using 1 M KOH. The neutralized supernatant was allowed to stand for 30 min in an ice bath to precipitate most of the potassium perchlorate, which was then removed by filtration. The filtrate solution was made up to 20 ml and then stored at -30 C until analysed. HPLC analyses were carried out using a Merck-Hitachi Model D-6500 (Merck Ltd., Poole, Dorset, UK) apparatus equipped with a diode array detector (Merck-Hitachi L-4500) and an intelligent pump (Merck-Hitachi L- 6200A). For nucleotides determination, the column was a Sphereclone ODS 2 C18, 150×4.60mm, particle diameter 5μm. The column was purchased from Phenomenex (Macclesfield, Cheshire, UK). Nucleotide standards (Adenosine 5’- Triphosphate, Adenosine 5’-Diphosphate, Adenosine 5’-Monophosphate, Inosine 5’-Monophosphate, Inosine, Hypoxanthine) and potassium hydroxide were purchased from Sigma- Aldrich Chemical Company, Poole, Dorset, UK. Acetonitrile and HPLC grade water were obtained from Philip Harris Scientific, Lichfield, Staffordshire, UK. For data analysis, student t-test and standard deviation were used. Significance of differences was defined at P≤0.05. Statistical comparison was based on 3 samples for each treatment for each specific storage time. The patterns of nucleotide degradation in sardine stored in boxes without ice at 4ºC, in vacuum package, modified atmosphere package are shown in Figures 1, 2 and 3, respectively. Nucleotide degradation was found to be more rapid in sardine stored in boxes without ice at 4ºC than those stored in MAP and VP. ATP content was not detected under the three conditions. AMP and ADP levels were less than 0.2 μmol/g on day 0 in all cases and then decreased gradually during storage period. Initial IMP levels were high, but then rapidly decreased especially from day 0 to day 6 in all cases. Level of IMP in sardine stored in boxes without ice at 4°C, in VP and MAP dropped from an initial value of 3. 87 μmoles/g to 0.04 μmoles/g, 0.062 μmoles/g and 0.07 μmoles/g at the end of storage period (day 15), respectively. 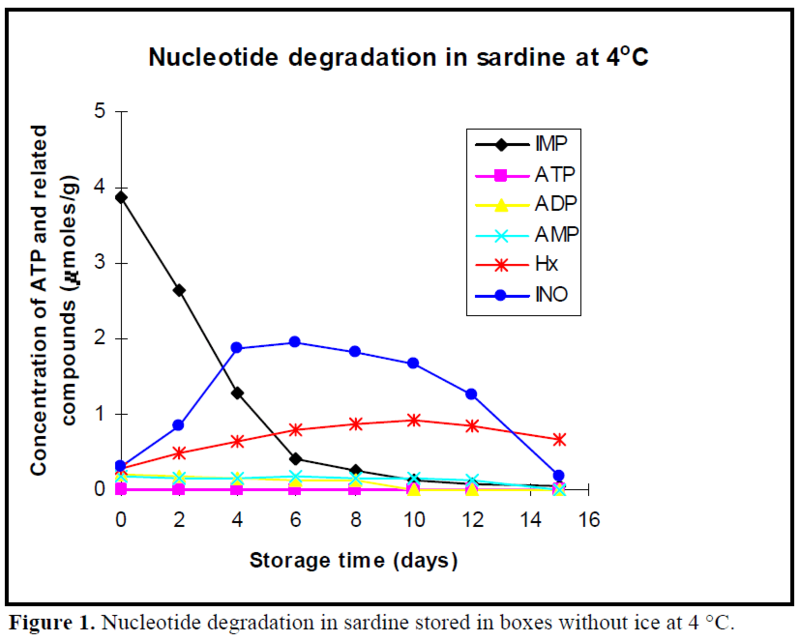 Figure 1: Nucleotide degradation in sardine stored in boxes without ice at 4 °C. Figure 2: Nucleotide degradation of sardine stored in MAP. 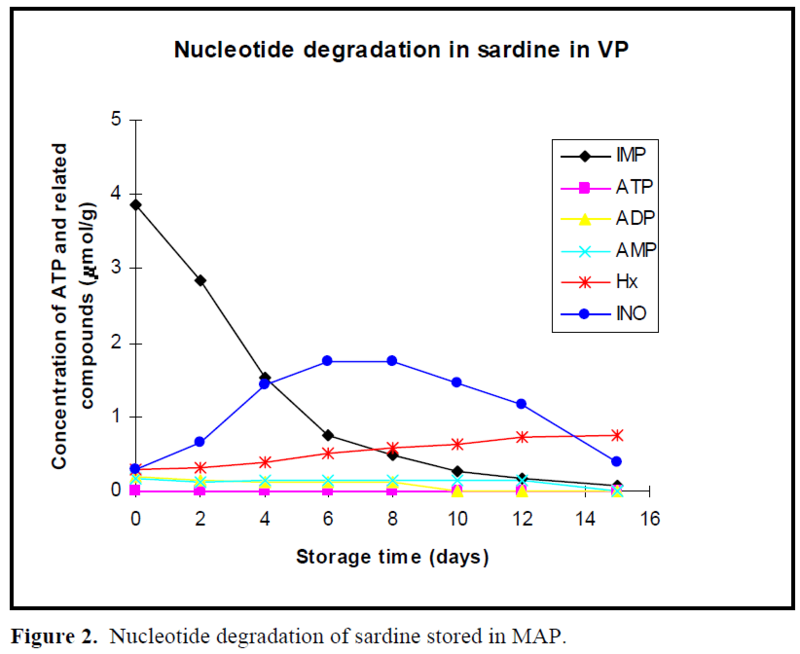 Figure 3: Nucleotide degradation of sardine stored in VP. In previous work (Özogul et al., 2004), the observed shelf life of sardine was found to be 3 day in boxes without ice at 4 °C, 9 day in VP and 12 day in MAP. When the sardine was acceptable according to sensory assessment for 4°C, VP and MAP, concentrations of IMP were approximately, 2, 0.3, 0.2μ moles/g, respectively. When the fish were acceptable in terms of sensory analysis for stored at 4°C, VP and MAP, Ino content was approximately 0.6, 1.6, 1.4 μmoles/g, respectively. Hx value increased linearly with storage time. Levels of Hx showed constantly increase in fish in stored MAP and VP, but these increases were slightly more rapid in MAP than those in VP. The maximum levels of Hx compound were 0.79 μmoles/g for MAP and 0.75 μmoles/g for VP at day 15, respectively. In the early post mortem stages, ATP in the muscle of all fish species degraded rapidly to IMP via ADP and AMP, while IMP tended to decrease on account of slower subsequent breakdown to Ino (Mende et al., 2001). In this study, nucleotide degradation was found to be more rapid in sardine stored in boxes without ice at 4ºC than those stored in MAP and VP. Since they were in two days postmortem (days 2), when the fish arrived on laboratory, ATP content was not detected under the three conditions. AMP and ADP levels were less than 0.2 μmol/g on day 0 in all cases and then decreased gradually during storage period. Similar results were found for Atlantic herring stored in ice, modified atmosphere and vacuum pack studied by Özoğul et al. (2004). The low ATP, AMP and ADP values were also observed for freshwater rainbow trout stored in ice and vacuum pack (Rodriguez et al., 1999) and modified atmosphere pack (Özoğul and Özogul 2002). In present study, initial IMP levels were high, reflecting a rapid conversion of ATP into IMP but then rapidly decreased especially from day 0 to day 6 in all cases. Veciana-Nogues et al. (1997) found that IMP content in tuna decreased, reaching very low values at the end of study at the three temperatures (0ºC, 8ºC and 20ºC). In the present study, similar result was observed under all storage conditions. Level of IMP in sardine stored in boxes without ice at 4°C, in VP and MAP dropped from an initial value of 3.87 μmoles/g to 0.04 μmoles/g, 0.062 μmoles/g and 0.07 μmoles/g at the end of storage period (day 15), respectively. These results agreed with findings of Özoğul (2001), reporting that loss of IMP from the muscle of herring stored in MAP proceed much slower than that held at 2 ±2°C in boxes and VP. This shows IMP values are not useful freshness index for all sardine samples during storage due to the fluctuations of IMP content. Inosine (Ino) and hypoxanthine (Hx) contents increase when IMP contents begins to decrease (Hamada-Sato et al., 2005). When the fish were acceptable in terms of sensory analysis for sardine stored in boxes without ice at 4°C, VP and MAP, Ino content was approximately 0.6, 1.6, 1.4 μmoles/g, respectively. Hx value increased linearly with storage time, it is appeared to be a good freshness indicator for sardine stored in MAP and VP until the end of the storage, but not in sardine stored in boxes without ice at 4ºC. However, Rodriguez et al. (1999) suggested that Hx ratio was useful indicators of freshness for trout stored in ice but not for vacuum-packed trout stored under refrigeration. Levels of Hx showed constantly increase in fish in stored MAP and VP, but these increases were slightly more rapid in MAP than those in VP. The maximum levels of Hx compound were 0.79 μmoles/g for MAP and 0.75 μmoles/g for VP at day 15, respectively. Özoğul (2001) reported that concentration of Hx increased gradually with storage time for herring kept under MAP. CO2 lowered the Hx content when compare to other storage conditions. In sardine stored in boxes without ice at 4ºC, the value of Hx showed a increase until 10 days and then a drop. Dhananjaya and Stroud (1994) found that increases of Hx in whole, filetted herring and cod stored in MAP were generally lower than that of unpacked fish, and content of Hx in CO2 packed herring was lower than that in unpacked herring. 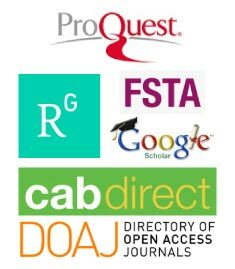 Cann et al. (1984) found that Hx level in herring fillets stored at 60% CO2 and 40% N2 was 2.35 μmol/g in MAP and 4.13 μmol/g in VP at 11 days of storage at 0 ºC. Warthesen et al. (1980) reported that Hx contents of fish stored in 100% CO2 were lower than in fish stored at lower CO2 concentrations. Özoğul and Özoğul (2002) reported that hypoxanthine values for trout samples aerobically held in ice were higher than those for trout held in MAP (40% CO2, 30% O2 and 30% N2). Atlantic cod or Pacific cod have been observed to rapidly accumulate a large amount of Ino compared with the accumulation of Hx when the level of IMP rapidly decreases (Özogul et al., 2004, Luong et al., 1992). In present study, similar results were found. The content of Ino constantly increased to 1.74 μmol/g for VP and 1.22 μmol/g for MAP packed fish until 8 days. Inosine content also at 4°C increased to 1.94 μmol/g until 6 days, which after it decreased. In conclusion, production of ATP derivatives decreased slowly in sardine stored MAP compared to sardine stored in boxes without ice at 4°C. This indicates that presence of CO2 may have an effect on nucleotide level. It can be inferred that Hx content might be used as a freshness indicator for sardine stored under MAP and VP since it increased linearly with storage time. Barnett, H.J., Conrad, J.W., Nelson, R.W., (1987): Use of laminated high and low density polyethylene flexible packaging to store trout (Salmogairdneiri) in modified atmosphere. Journal of Food Protection, 50(8): 645–651. Cann, D. C., Smith, G.L., Houston, N.C., (1983): Further studies on marine fish stored under modified atmosphere packaging. Torry Research Station, Aberdeen: Ministry of Agriculture Fisheries and Food. Chouliaraa, I., Savvaidisa, I.N., Panagiotakisb, N., Kontominasa, M.G., (2004): Preservation of salted, vacuum-packaged, refrigerated sea bream (Sparusaurata) fillets by irradiation: microbiological, chemical and sensory attributes. Food Microbiology, 21: 351–359. Dhananjaya, S., Stroud, J., (1994): Chemical and sensory changes in haddock and herring stored under modified atmosphere. International Journal of Food Science and Technology, 29: 575-583. Dingle, J.N., Hines, J.A., (1971): Degradation of inosine 5-monophosphate in skeletal muscle of several north Atlantic fishes. J. Fish. Res. Bd. Canada, 28: 1125. Fagan, J.D., Gormley , T.R., UíMhuircheartaigh, M.M., (2004): Effect of modified atmosphere packaging with freeze-chilling on some quality parameters ofraw whiting, mackerel and salmon portions. Innovative Food Science and Emerging Technologies, 5: 205–214. Gram, L., Huss, H., (1996): Microbiological spoilage of fish and fish products. International Journal of Food Microbiology, 33: 589–595. Hamada-Sato, N., Usui, K., Kobayashi, T., Imada, C., Watanabe, E., (2005): Quality assurance of raw fish based on HACCP concept. Food Control, 16 (4):301-307. Huynh, M. D., Mackey, R., Gawley R. (1992): Freshness assessment of Pacific fish species using K-value. In: Seafood Science and Technology (edited by E. Graham Bligh), Oxford: Fishing News (Books) Limited, 258-268. Kennish, J. M., Kramer, D. E. (1986): A review of highpressure chromatographic methods for measuring nucleotide degradation in fish muscle. In Seafood Quality Determination. Procedings of an International Symposium Coordinated by the University of Alaska. Sea Grant College Program, Anchorage, Alaska U.S.A. l&l4 November, ed. Kramer D. E. & Liston J. Elsevier Science Publishers V., Amsterdam, Netherlands, 209-219. Luong, J. H. T., Male, K. B., Masson, C., Nguyen, A. L. (1992): Hypoxanthine ratio determination in fish extract using capillary electrophoresis and immobilised enzymes. Journal of Food Science, 57: 77- 81. Mendes, R., Quinta, R., Nunes, M. L. (2001): Changes in baseline levels of nucleotides during ice storage of fish and crustaceans from the Portuguese coast. Eur Food Res Technol., 212 :141–146. Murata, M., Sakaguchi, M. (1986): Storage of yellowtail (Seriolaquinqueradiata) white and dark muscles in ice: chances in content of adenine nucleotides and related compounds. Journal of Food Science, 51:321- 326. Özogul, F., Taylor, K. D. A., Quantick, P., Özogul, Y. (2000a): Chemical, microbiological and sensory evaluation of Atlantic herring (Clupeaharengus) stored in ice, modified atmosphere and vacuum pack. Food Chemistry, 71: 267–273. Özogul, F., Taylor, K. D. A., Quantick, P., Özogul, Y. (2000b): A rapid HPLC determination of ATP related compounds and its application to herring stored under modified atmosphere. International Journal of Food Science and Technology, 35; 549– 554. Özogul, F. (2001): The effect packaging systems on quality and safety of herring. PhD dissertation.Lincoln, U.K: Univ.of Lincoln. Özogul Y., Özogul., F. (2002): Degradation Products of Adenine Nucleotide in Rainbow Trout (Oncorhynchusmykiss) Stored in Ice and in Modified Atmosphere Packaging. TÜBITAK, Turk J. Zool ., 26: 127-130. Özogul, F., Polat, A., Özogul, Y. (2004): The effects of modified atmosphere packaging and vacuum packaging on chemical, sensory and microbiological changes of sardines (Sardinapilchardus). Food Chemistry, 85: 49–57. Park I.S. and Kim, N. (1999): Simultaneous determination of hypoxanthine, inosine and inosine 50-monophosphate with serially connected three enzyme reactors. AnalyticaChimicaActa., 394: 201–210. Ruiz-Capillas, C., Moral, A. (2004): Free amino acids in muscle of Norway lobster (Nephropsnovergicus (L.) in controlled and modified atmospheres during chilled storage. Food Chemistry, 86:85–91. Rodriguez, C. S., Besteiro, I., CruzPascual. : Biochemical changes in freshwater trout (Oncorhynchusmykiss) during storage. Journal of the Science of Food and Agriculture J., 1999; 79:1473-1480. Ryder, J. M., Buisson, D. H., Scott, D. N., Fletcher, G. C. (1984): Storage of New Zealand jack mackerel (Trachurusbnovaezelandiae) in ice: chemical, microbiological and sensory assessment. Journal of Food Science, 49: 1453-1456. Saito, T., Arai, K. and Matsuyoshi, M. (1959): A new method for estimating the freshness of fish. Bull. Japan. Sot. Sci. Fish., 24: 749-750. Scott, D. N., Fletcher, G. C., Summers, G. (1984): Modified atmosphere and vacuum packing ofsnapper fillets. Food Technology Australia, 36 (7):330 334. Uchiyama, H., Ehira, S., Kawahara, T., Shimidu, W. (1970): Significance in measuring volatile base and trimethylamine nitrogen and nucleotides in fish muscle as indices of freshness. Bull. Japan. Soc. Sci. Fish., 36: 177. Vazquez-Ortiz, F. A., Pacheco-Aguilar, R., Lugo-Sanchez, M. E., Villegas-Ozuna, R. E. (1997): Application of the Freshness Quality Index (K Value) for Fresh Fish to Canned Sardines from Northwestern Mexico. Journal of Food Composition and Analysis, 10: 158–165. Veciana-Nogues, M. T., Albala-Hurtado, M. S., Izquierdo-Pulido M., Vidal-Carou, M. C. (1996): Validation of a gas-chromatographic method for volatile amine determination in fish samples. Food Chemistry, 57: (4), 569-573. Veciana-Nogues, M. T., Izquierdo-Pulido, M., Vidal-Carou, M. C. (1997): Determination of ATP related compounds in and canned tuna fish by HPLC. Food Chemistry, 59(3):467- 472. Warthesen, J. J., Waletzko, P. T., Butsa, F. F. (1980): High performance liquid chromatographic determination of hypoxanthine in refrigerated fish. Journal of Agricultural and Food Chemistry, 28: 1308-1309.